In this week’s blog: we write our own epitaph; we rebuild our crowdsourcing platform; and we go to lots of events. 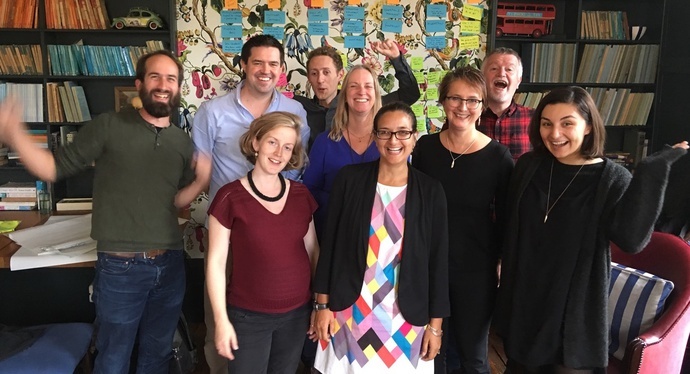 Last week we gathered our board together in the sunny climes of East London for a day of plotting the future. To help us draw out some ideas, one of the tasks set by our facilitator was to write Democracy Club’s epitaph. By happy coincidence, each of the three groups imagined a different time of death to write about, almost giving us short, medium and long-term vision statements. These sketches, and our conversations around them, will help contribute to a new vision statement, which we’ll be working on with some of the board for the next few months. We’re keen for your feedback and thoughts! Who’s our audience currently? Who should our audience be? Who else shares such a vision? Which organisations? How are we going to work together? What’s the geographical scale we want to look at? What’s the breadth of democracy issues we want to look at? What policy (and advocacy) work do we need to do? What’s the change we can measure? Other stuff to come out of the away day: an internal calendar for the next year (add stuff we’ve forgotten!) and a not inconsiderable list of stuff we need but don’t currently have, which we’ll elucidate in another blog post soon. On Tuesday, we joined the open data co-working event in Cardiff (thanks Indycube and ODI Cardiff) to do some sprint planning. The big scary technical work being done right now is to renew the candidates crowdsourcing platform, which has been held together with string for too many elections. Originally built as a database for storing details of individuals, we’ve layered elections, parties and results on top of it, til it resembles a slightly unnerving jenga tower. Sym and Chris have been cracking through this work and will continue to do so during this sprint. What’s exciting is that in a not too distant future, this might mean the ability to add new features to the crowdsourcing platform. There’s an issue list as long as your arm on Github, and we’ll be keen for your views on what should be a priority. Last night, The Observer newspaper and Nesta, now a charity, formerly the National Endowment for Science, Technology and the Arts, had their biennial shindig celebrating 50 New Radicals: people and projects across the UK radically reforming the way we live. We were new and radical once, so Nesta kindly invited us along to tell the story of our time since then. It was inspiring to meet a giant room full of people trying their damnedest to make things better. There’s a lovely Observer print magazine dedicated to all the radicals, but you’ll have to go back in time to last Sunday to buy it. Happily, the 50 are also online here. Today and tomorrow, the great and good of digitally minded folks get together to plot and plan for better local government: follow the unconference on twitter. This morning a minister for local govt announced that a local gov digital fund will open next week. We’d love to chat about ideas for digital services for democracy with any local authorities who fancy a project! Also this weekend (and beyond) is the bombastically named The World Transformed festival, which will bring lots of people with new ideas together in Liverpool. Joe will be at any workshop/talk with ‘democracy’ in the title. Last July we joined pals across the can-we-make-democracy-any-better space at the wonderful People’s History Museum in Manchester to celebrate National Democracy Week, timed to coincide with the women’s suffrage anniversaries. The Cabinet Office have now run an evaluation of the week and we’re curious to see whether it met their expectations and whether the week will live on. We’ll be in Whitehall next Thursday to learn more.